Join the hundreds of organisations using SystemsLink to reduce energy consumption & cost. With a widespread customer base through public and private sector as well as leading energy consultants, Energy Manager has proven to be as in-depth and intuitive as it is easy to install and start using. All utilities (e.g. Electricity, Gas, Water, Oil, Solid Fuel, Biomass, LPG, Waste) may be monitored and analysed using the Reports build into Energy Manager. Monitoring and Targeting allows easy identification of waste or overspend and allows savings to be tracked. Many sources of data can be automatically imported such as invoices from suppliers via either EDI or spreadsheets, profile data from Building Management Systems, Half Hourly Meters and AMR (find out more about AMR collection here). Full data validation, tolerance checks and alarms provide immediate and real-time management information. Your organisation can benefit from enhanced data accuracy, live energy information in both desktop and online packages and the ability to utilise staff time in finding the savings, not processing the information. I’m absolutely delighted with SystemsLink – switching to you was the best thing we ever did and you’ve already helped us create thousands and thousands of pounds in savings on Council energy bills, with more predicted as we find out more and more that SystemsLink can enable us to do. Trend analysis and comparison with previous performance. Comparison with targets or benchmarks. Ranking of sites according to performance. Many users benefit from a flexible reporting package built into the system. 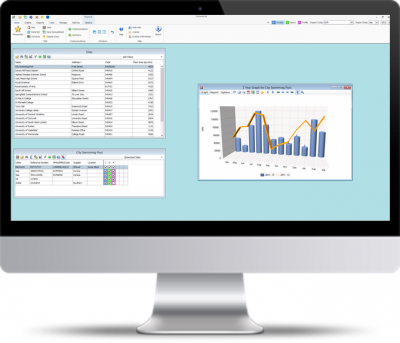 As well as a suite of reports covering fundamental monitoring and targeting requirements, the ability to create custom reports within the software allows users to easily configure their own energy reporting solution. At a more advanced level, the software also incorporates CUSUM, Regression-Analysis and Degree-Day adjustment methods to provide closer monitoring of waste and savings. SystemsLink have honed their customer service care, and quick to resolve the question asked.